Visit an affiliate today :) Affiliates are located in the side bar. 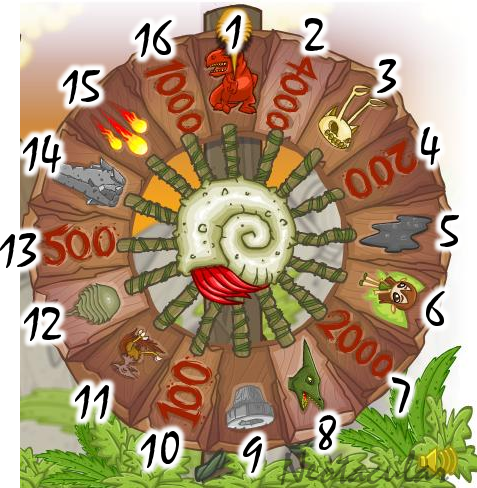 This wheel is located in the heart of Tyrannia and it will cost you 100 NPs to spin the wheel. One of the great things about this wheel is that you can spin the wheel every 40 minutes. 1 A Grarrl roars at your Neopet. 2 You are awarded 4,000 NP and an avatar! 3 One of your pets' abilities is lowered by one level. One ability must be in the "active" state or nothing will happen. 4 You are awarded 200 NP! 5 You lose a random item in your inventory to a tar pit. 6 One of your pets' abilities is raised by one level. 7 You are rewarded 2,000 NP! 8 A pterodactyl swoops down and bites your active pet, causing it to lose some health. 9 You are awarded random Tyrannian furniture item. 10 You are awarded 100 NP. 11 A random Tyrannian petpet. 12 A random Tyrannian food. 13 You are awarded 500 NP! 15 Fireballs rain down and singe your Neopets, causing them to lose some health. 16 You are awarded 1,000 NP! Spin and land on the space where you recieve 4,000 NPs on the Wheel of Mediocrity. Any errors spotted in the above guide? Tell us!